» Conservation of natural resources through optimal utilization. » Compliance with all applicable environmental legislations. » Control of air emissions, water discharge and land contamination. » Minimization of waste generation. 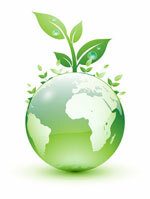 » Generate environmental awareness in all our employees and business associates, for their roles & responsibilities. » Complying with applicable environmental legal & other requirements and follow our own objectives & targets.